GOING GREEN Wine isn't the only way to get your antioxidants. A teahouse in the middle of wine country? Why not. The Taste of Tea in downtown Healdsburg offers more than just a cup of tea. Owners Donna and Nez Tokugawa initially planned to focus on a business that was 80 percent production and 20 percent retail. But after finding a space on North Street and gauging local interest, they decided to offer a full-blown teahouse with food offerings. Taste of Teas also features a spa with tea-based treatments. "Healdsburg is really foodie-centric with both locals and visitors, who truly understand the relationship between how and where things grow and how they taste," says Donna, who believes tea fits perfectly in Sonoma County. "There are a lot of similarities. People love using their winetasting and pairing skills with tea." 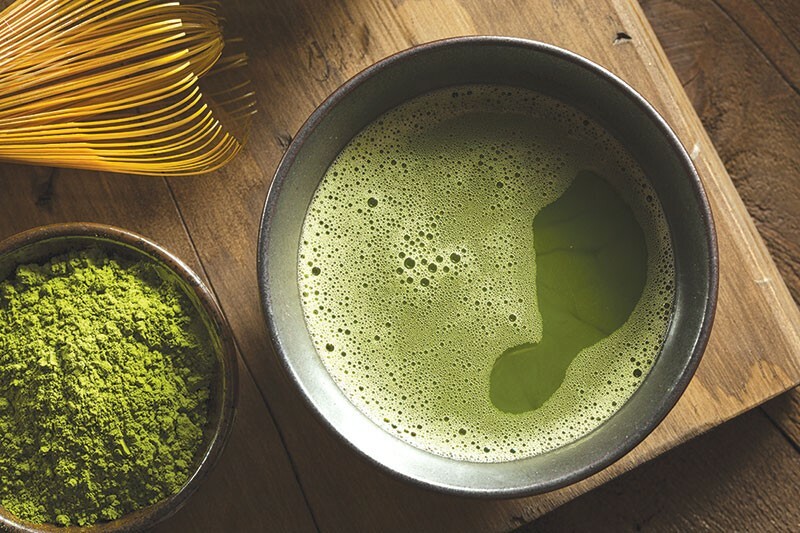 The couple, with help from marketing director and daughter Tai, import teas from Japan, Taiwan and China, and also create their own blends at a facility in Germany. Tea is available by the pot ($6) or cup ($4), or by siphon pot ($7), in which custom blends of tea and spices are extracted in a process involving an alcohol-fueled burner. Tea options are many: sencha, jasmine, oolong, puerh, black blends and more. The milky oolong is creamy and buttery without a drop of dairy. The Kyoto bancha is dry and slightly bitter, with a lasting finish. The emerald "Marteani" ($7), a fun twist on the alcoholic classic, is a delicate mix of matcha, coconut milk and mint syrup. The mixture is shaken like a cocktail and served in small glasses with a mint sugar rim and fresh mint garnish. The food menu, not intended to take center stage, serves, rather, as a light accompaniment to the tea. "As we were building out the space," says Donna, "we had several people walking by asking for ramen, noodles and Asian-inspired healthy choices." One customer, Doug Provisor of Provisor Vineyard, organized a tasting of Nez Tokugawa's cooking, and the feedback convinced the couple to add food to the menu: ramen and udon, Japanese curry rice, a variety of rice balls and a couple of noodle and farro salads. I tried the moderately spicy and refreshing green tea, soba noodle salad ($11), with Napa cabbage, mushrooms and a bright miso vinaigrette. It's a delicate but filling appetizer. The ramen ($12) is served with a fish cake instead of the customary egg, and isn't as deeply flavored as some I've tried, but it pairs well with the tea. The Japanese green-tea roll cake ($3.50), made with matcha powder and filled with whipped cream, is an airy and memorable dessert. The decor is minimal and unassuming, so it might come as a surprise that Taste of Tea also has a "relaxation room" in the back of the shop, where customers can get tea-infused face masks and foot soaks. The Tokugawas have introduced their teas to spas and wellness centers, so they decided to try a tea-based spa of their own. A tea tasting in the softly lit space, followed by a tea foot soak, facial mask and neck wrap goes for $75. "Most people," says Donna, "don't want to leave." Over a cup of tea on a rainy day in Healdsburg, that's how I felt. Taste of Tea, 109 North St., Healdsburg. 707.431.1995. thetasteoftea.com.